ADDRESS: 2029 Gardenbrook Lane, Tallahassee, FL 32301. Off Victory Garden Drive between Park and Apalachee Parkway inside Capital Circle. Eastside. Near Bus Routes 22 & 25. APPLICATION: Written Application for verification of Rental History, Employment & Income Verification, Credit Report, etc. $50.00 Application Fee per Person or per Married Couple. Application fee is non-refundable. UTILITIES: Tenant pays for all Utilities: City of Tallahassee, Cable, Internet and Phone Service. Property Manager changes Air Conditioning Filters Monthly. LIVING AREA SIZE & ROOMS: Living Room has a Brick Corner Wood Burning Fireplace, Living/Dining Comb (L-shaped) open to the Kitchen with a Bar. There is an Inside Laundry. About 1000 Sq. Ft. LAUNDRY APPLIANCES: Washer & Dryer are Optional. SECURITY DEPOSIT: $950.00. This is not the last month’s rent. NO SMOKING: No Smoking Inside or Outside. PETS: Pets under 30 lbs. may be considered. There is a Pet Application and Interview with the Pet. Pet Fee varies with the Pet ($250.00 per Pet). This is Non-refundable. With pets, the tenant must have a Tenant’s or Renter's insurance policy addressing Pet Liability. 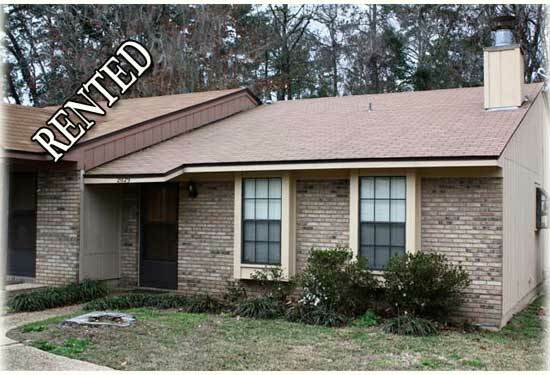 AMENITIES: Tile Floors throughout with Carpet in the Master Bedroom. Ceiling Fans. Window Treatments. Fenced Backyard. Two Parking Spots. In Excellent Condition. Close to Koger, Governor’s Mall and Downtown. Call 850.545.9390 for Appointment to View, Application and Interview. Joan H. Raley, REALTOR®, Property Manager. Content is © Copyright Joan H. Raley, 2010.